Well, I am back from SiWC (the Surrey International Writers Conference) and that means it is time to finish what I started with my "Send me to SiWC" campaign. Never fear, I did learn how to write my way out of a wet paper bag whilst at the conference as planned and the daring rescue of my husband and cats from the dastardly aliens will be written shortly. In the weeks leading up to the conference, I was really really really broke. I had spent my last penny to buy my ticket. I didn't even have money yet for my share of the hotel room I was staying in. Luckily, by the time I bummed a ride from my poor step-father (who drove down across the border to get me and then did it again to drive me home), I had managed to wrangle enough money for the hotel. Phew! The whole reason I wanted to attend this year, was because last year I had helped out with a vendor table and, even experiencing the con on the periphery, I had an overwhelming sense of belonging and camaraderie with everyone I met. But it had been a year since I had felt those feelings. All I was feeling, as I drove to the 2014 con, was broke. So I kept telling myself: just this once. And then I got there. Within about five minutes all those old feelings of goodness and wonder came back to me and I thought: I can't just come once! And the best parts of the weekend were still to come. For me, the sessions and workshops are only a tiny fraction of what makes a writes conference awesome. I have been to countless sessions and workshops at conferences, colleges, writers group meetings, and they always provide terrific gems of wisdom. What I am looking for at a conference is people like me to connect with. There is no better place to find connection than SiWC. Interaction and chumminess are the rule not the exception. When you sit down with your fellow attendees, either in sessions or at meals, everyone just starts talking to each other. One evening, I was sitting on my own, having just lost my "wingman" for the conference because she had to go home early, and out of the blue a group of women invited me to join them in their carousing. Interaction with the presenters is just as rewarding. Nobody acts like they are better than anyone else. They have all the time in the world to talk or take a picture with you. You eat meals with your writing heros, and have regular conversations with them, like they are your neighbor from down the street. Some writers enjoy a "living legend" kind of status at SiWC, and yet if you listen to what they say, sometimes you can detect the same insecurities and doubts in them that we all face as writers. No matter who we are or how many books we have written, or how well known we are--at SiWC we are all just writers and we are in it together. 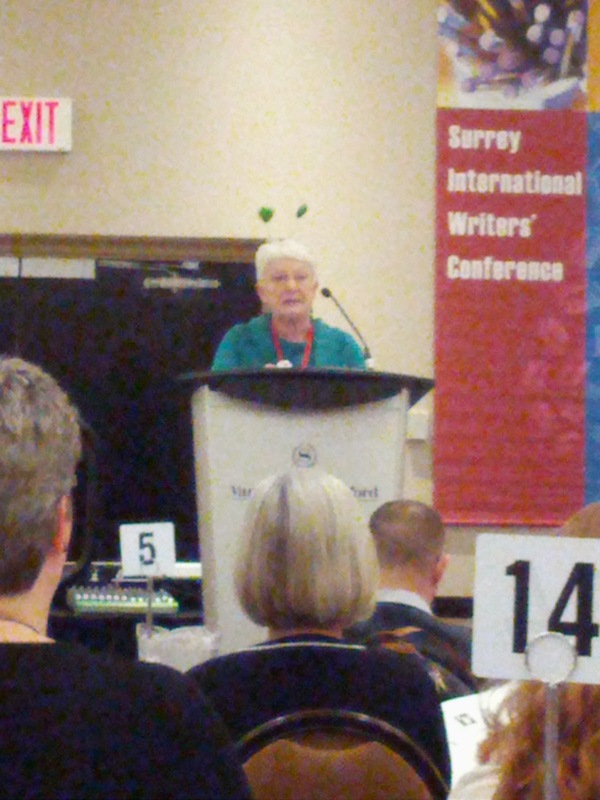 And I am so happy that SiWC encourages young writers. When I was a young writer in Canada I felt the opposite of encouraged. My mother was telling me I needed a "real job" and my creative writing teachers were telling me that unless I was a complete and utter genius, Canadians just don't usually find success as authors--that I should give up. I graduated high school in 1992, which I believe was the first year of SiWC, but I was not lucky enough to find out about it then. Within two years I had given up on writing, partly due to being discouraged at every turn and partly because university was not easy for me. I gave up reading and writing unless it was for academic purposes, and it took me a lot of years post-graduation to finally rediscover my passions. I am thrilled that there is now a conference in my old stomping grounds that encourages writers of all ages. A gathering of people who will tell a young writer "yes you can!" and "never give up on your dreams!" And one last thing, because I am rambling now. I have to give full props to conference organizer Kathy Chung. There are a lot of people involved in the conference, who do a lot of work. But Kathy's name is all over the place. "If you want info, contact Kathy..." is like a mantra on the website. I was in email contact with her a couple times leading up to the conference, and I would have thought that she would be busy and overwhelmed and couldn't possibly get back to me as quickly as she did. But every time the response was almost instant--always cheerful and helpful. I just don't know how she does it. As the conference was wrapping up I wanted to congratulate and thank Kathy personally. I walked over to where she was with a group of people, but she seemed very busy. I was just little old me, and what I had to say wasn't all that important, so after hanging around a few minutes and seeing that there were just too many other people who wanted a piece of her, I figured I would go and send an email later with all my kudos and gratitude. And as I walked away I heard someone call out behind me. Kathy had pulled herself away from the crowd and asked me if there was something I needed. I was blown away by that little gesture. Wow. I was important. 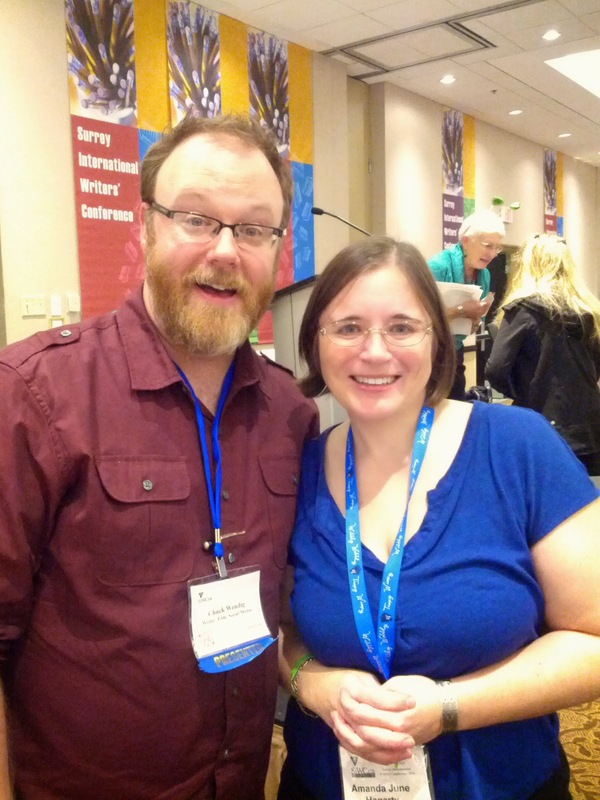 No matter who we are, at SiWC we are all just writers in it together. Thank you Kathy, and thank you SiWC. Have a thought? Please share it. I want to hear from you. Author, Virtual Land Baroness, Rowdy Canadian. I write fast paced MG/YA fantasy fiction that will make you binge way past your bedtime & leave you wanting more. © 2015 Amanda June Hagarty. Please ask permission for reprinting/redistributing. Awesome Inc. theme. Powered by Blogger.